The state capital of Georgia and also the biggest city in the state, Atlanta is home to around half a million people, putting it in the top 40 most populated cities in the United States. It's the main cultural and economic center for the state of Georgia and is also home of the world's busiest airport: Hartsfield–Jackson Atlanta International Airport. Known as 'The City in a Forest', Atlanta is famous for its many tree-lined streets and public parks, with over 3,600 acres of parks, preserves, and gardens found throughout the city, making it a great place for nature lovers and people who enjoy spending time outdoors in natural environments. The city is also well known for its unique landmarks and attractions like the Centennial Olympic Park, the World of Coca Cola museum, the Georgia Aquarium, and various monuments and museums related to the Civil Rights Movement and Martin Luther King Jr. If you're planning on visiting Atlanta sometime soon, a great way to cut down the costs of your stay is to spend some time in a hostel. With low cost dorms and private rooms, along with plenty of additional amenities and features like Wi-Fi access, lounges, bars, communal kitchens, organized activities, and more, hostels in Atlanta are both affordable and enjoyable places to stay in. However, Atlanta, unlike many other major cities around the United States, doesn’t have too many options when it comes to hostels. 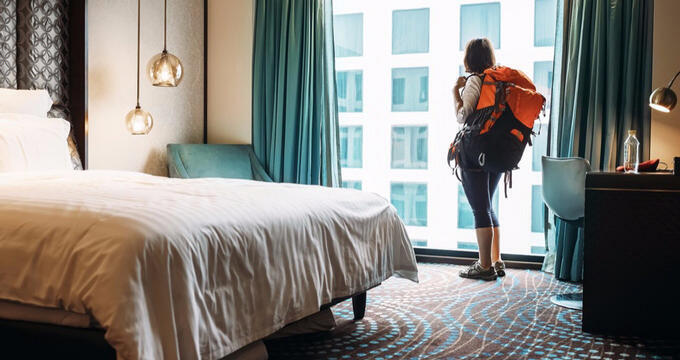 In fact, there are only two hostels currently anywhere near the city, so read on to learn more about these locations and find out which one might be right for you. Located in a great spot, just south of the Downtown area of Atlanta, The Atlanta Hostel & BNB is the main hostel for the state capital of Georgia. This is the place people come when they're looking to stay in Atlanta for a low price and really be able to explore the city, making the most of every single day and using the money they've saved to visit various attractions, eat at some of the city's best restaurants, and do some shopping too. You'll find that the location of The Atlanta Hostel & BNB is just right for visitors to the city. The local area is quite quiet and calm, so you don't have to worry about too much noise or traffic, but you're still not too far away from some major attractions and landmarks like the Zoo Atlanta, Georgia Aquarium, the World of Coca Cola, and the Centennial Olympic Park. Past guests only seem to have great things to say about The Atlanta Hostel & BNB, with many guests rating this hostel highly for its cleanliness and comfort, as well as its super location. You'll be able to book both private and shared rooms at The Atlanta Hostel & BNB and, as this location also doubles up as a bed and breakfast, you can enjoy a delicious and wholesome breakfast in the morning if you wish before you head out to explore the city. You'll also be pleased to see that all the rooms are nicely decorated with colorful bedspreads and wooden floors, with that same sense of cleanliness and comfort also present in the bathrooms. There's a communal deck area at this hostel, as well as a spacious dining area and lounge space too. The other hostel option for visitors to Atlanta, Georgia is El Caribe Hostel. This hostel is located in Hammond, which is found up in the northern part of Atlanta. It's quite a trip down into the center of the city from here, so it's not the best place to stay if you're looking to visit places like the zoo, aquarium, and Coca Cola World, but it is very nicely placed for wildlife enthusiasts and outdoor recreation opportunities. You'll be able to visit Morgan Falls Overlook Park, the Chattahoochee Nature Center, and the Chattahoochee River National Recreation Area within less than an hour from this Atlanta hostel, so if you're heading to Atlanta to spend some quality time in natural surroundings and doing some wildlife spotting, this is a super hostel to choose. The hostel itself features a round-the-clock front desk, nicely decorated rooms with their own mini kitchens and en-suite bathrooms, air conditioning throughout, private TVs, free toiletries, DVD players, and Blu-Ray players too, and you'll find that all rooms also feature little seating areas with comfortable chairs.